The four-place Hiller OH-23 Raven light observation helicopter was based on the UH-12 ("UH" for United Helicopters), which was first flown in 1948. The H-23 Raven performed as a utility, observation, and MedEvac helicopter during the Korean war. Model numbers ranged A through D, F and G. The H-23A had a sloping front windshield. The H-23B was used as a primary helicopter trainer. 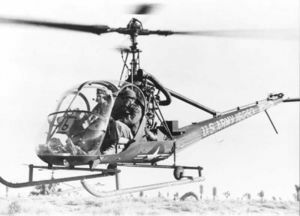 Beginning with the UH-23C, all later models featured the "Goldfish bowl" canopy similar to the Bell 47, and also featured the Bell-designed short weighted gyro-stabilizer bar.Template:Vs The OH-23 had a speed of 97 mph (84 knots). The Raven had a two-bladed main rotor, a metal two-bladed tail rotor. Both the OH-23B and the OH-23C were powered by one O-335-5D engine. The OH-23D was a purely military version with a 0-435-23C engine and a more reliable transmission. Most OH-23Ds were replaced by the OH-23G, the most common version of the Raven, with a more powerful Lycoming O-540-9A six-cylinder, horizontally opposed, air cooled 305 hp engine. The OH-23G could seat four. The MEDEVAC version carried two external skid-mounted litters or pods. The Raven saw service as a scout during the early part of the Vietnam war before being replaced by the OH-6A Cayuse in early 1968. The Raven could be armed with twin M37C .30 Cal. machine guns on the XM1 armament subsystem or twin M60C 7.62mm machine guns on the M2 armament subsystem. The XM76 sighting system was used for sighting the guns. ↑ Hiller 360 / UH-12 / OH-23 helicopter. This article on an aircraft of the 1940s is a stub. You can help Wikipedia by expanding it. This page was last edited on 6 March 2007, at 15:41.